Use this thread for discussion anything modding related that doesnt need a seperate thread. What tips do you guys have on how NOT to design a map? I'll be more specific. I decided to create an Eastern European town map with lots of close quarter elements as the map is designed to put an emphasis on infantry properly clearing out the streets, alleys and houses before vehicles can move through. My issue is that, because it's a settlement map, I don't have much terrain to break line of sight and so snipers and optics can see quite far across the map when inside a 2 storey building. This will encourage snipers to camp but on the other hand encourage squads to raid the sniper position and take control of them, therefore it's another objective which leads to more dynamic gameplay. Just wondering whether it's ok in a game of squad to have a map with long lines of sight or if it should be broken to discourage campers and lone wolfs. Another thing, despite its close quarter design, the map is very open and non-linear. On Sumari, I saw that Squads have a hard time sticking together and so I used low fences, lots of gardens, open green, dirt roads through the settlements and detached houses to ensure that there are plenty of paths to go through as you move with your squad. Is this the right approach to map design for close quarters? My tips would be to ensure a nice flow of movement, meaning that you have to really think about where the player is able to move, and create passages, alleyways, streets to enable him to move smoothly through the city, dont lead the player down a long alley just for it to be blocked of in the end. It really depends on what type of gameplay you want to promote, there is no real set standard. The use of lines of sight when done properly can like you have stated create entire game dynamics and adds that extra level of risk and consideration that must be made when navigating the urban areas. I urge you to experiment with it, but if you want my advice I would leave the snipers best positions quite exposed and vulnerable to UGL's and such, in order to preserve some semblance of balance. Also provide plenty of cover for the infantry too. On the second point I would say make sure not to make the paths too linear, make sure there is plenty of choice by allow them to maybe intersect, allowing the players to change their route easily if they need to, rather than forcing them along one route. but also don't make it too much of a maze otherwise people are bound to get disorientated and left behind. Keep on going and good luck, I look forward to seeing your progress! @Zeno ok that's cool. I'd like to think my map has a nice flow and allows for plenty of opportunities to attack from a different direction if the first few attacks fail. But this can be tested. There are hardly any areas that are blocked at the moment, however, in order to maintain authenticity (as well as increase tension) the gated community and the industrial site are quite linear due to their high security walls. They're the only 2 areas that are quite closed off though. I think the long lines of sight may work if it's done correctly. The modding community could play on each other's maps, see how they play out, give feedback and continue to refine the maps until they're playable. @FalkoN Despite there being just 2 caps, I'm hoping to increase dynamic gameplay by creating strong areas of the map that are beneficial to hold. For example, an open area close to the objective covered by terrace or semi detached houses would be safe for vehicles to wait before infantry have cleared the cap area of any major threats. However, the enemy may decide to sneak around and attack this safe area where vehicles are parked up and waiting. The industrial area may be a safe area for the attacking team to setup and defend their logistics operations due to the high walls and very few ways in. Therefore, these fights away from the cap become more important than fights on the cap. This gives players the opportunity to fight in other areas of the map rather than just in and around the cap every time they play. I dont think the map has a "best approach" to it. I'm sure we would see channels develop as players will find the best way to play the map but I am trying to make it as open as possible so that there are no best ways to approaching it. Can you let us know what your intentions are with your map? Or would you rather tell us later? Sounds good looks like you've definitely though about it. That map looks like a 512x512 map, might have to expand it if you plan to use it on full servers, other than that, great progress! Looks great Falkon. Plenty of opportunities to ambush vehicles. Will it be a skirmish map for smaller teams or are you planning to make it bigger later on? Ive got a similar line running through the map except it's a train track that's constructed about 10 metres below ground level. Would this game mode idea work. Team A has to clear out 2 areas of the map on Team Bs side. For example, one area is the estates and the other area is the high street. It could be a weapons cache or just capping the flag. Once those areas have been cleared, Team A needs to fall back and defend 2 chokepoints. Is that a fair game mode? Thanks guys, I think its turned out pretty well so far considering zero planning went into it and iv'e just made it up as I went along. 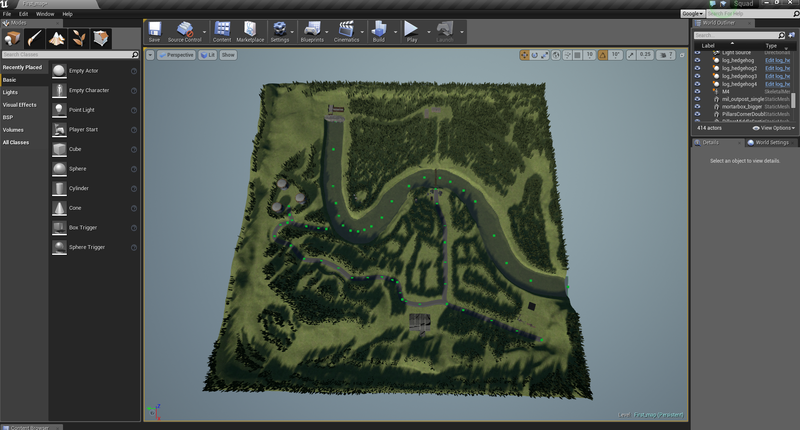 Its supposed to be a small skirmish type map with lots of dense woodland, which is difficult for vehicles to navigate, although I have left plenty of paths through the trees to allow for them. the next map i'll do will probably be a 4k trying to resemble the Lashkar Gah area of Afghan. @Odd_fella Not sure to be honest. the only way to really know would be to try it out I guess. I think I has the potential to work, though you would probably have to make sure that taking those two points is in the defending teams favour. Also that underground track sounds really cool, i'm assuming the players will be able to use it to move around the map unseen. Yea those defend points are on their side and they'll have time to setup a defence. The below ground level track will be useful for vehicles as well as I've made the sides slopey enough for them to climb up. The track is there to help add more dynamic gameplay as neither side can predict where the enemy is going to attack from as they have plenty of options. Once we get our maps up to standard, we'll test them by playing some games on them and getting feedback on what works and what doesn't. Irontaxi streaming a mapping session right now, get in here fellow mappers! SDK will be integrated in the Epic Games launcher! Big news, this means auto-updates and personally as a UE4 user i love the idea to have all into the EG launcher! Yay!!! Finally we've got this section!!! I'am so glad. This thread seems rather dead but I figured I would ask here before making my own thread. Anyone made sense of the SoldierAnimBP yet? I'm trying to learn from it as much as I can but sadly I can't really get the preview window to work properly. I can't make the character run etc and go through the state machines the way I would like to. Some insight from a developer would be appreciated a lot. Toby have you tried joining the modding discord? Completely forgot that is a thing. I'll have a look. Thanks! guys, ive got a problem, Squad kit is initializing but keeps freezing @ 71% and my CPU is running from idle to 100%! (i7 4790). anyone had this too, and solutions? As it has been said 100times and more on the discord and probably on the forums: First time running the squad SDK takes about 6 to 8 hours on a Pentium II 433MHZ. well you must be fun at parties... but the cpu taking 100% isnt a problem? yeh michael, i don't think it's a problem. the SDK hangs at 71% every start for 1 minute then finishes loading. don't kno what it does but it hits my cpu up as well. we likely to ever see the VXGI stuffs in Squad? even single bounce GI would be awesome. i ask because the standard UE dynamic lighting is difficult to wrangle and seems to have numerous problems. actually, why can't we just have accurate rendering. i find it sad that the engine cannot render shadows even close to accurately and that apparently solid surfaces can pass light through. 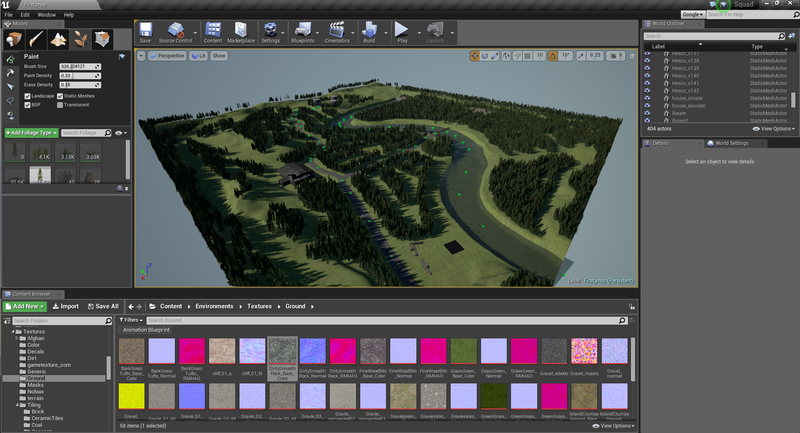 Guys, I'm new to Squad modding but I'm not new to UE4 content creation and I would like to try mod few thing in Squad starting with reworking ugly and poorly optimized default tree models of the game and maybe trying to create my own map. My question is though - what's the point? So far these new maps and mods don't go anywhere, can't be seen or tested by anyone, no one is interested in them if we talk about mainstream Steam players and there is a low chance devs would accept any of this into the game. So the only "use" of the new map for example would be just running around yourself shooting stones and fences. Or do I miss something and there is some kind of "testing" server or so? Please let me know. They do go somewhere, we are all waiting on the integration of steam workshop into the game, which have been mentioned to come early 2017. Until then we keep developing our maps and mods to get them ready for day 1 release. Also, Kokan was entirely community made, and that got included. And the devs have been really clear that they want manu more community maps in the main game. Making a propper map for squad takes a very long time, think months instead of weeks. So if you start creating you map now, you should be able to play it online way before you are finished with it. Are there any plans to incorporate some of the total conversion content that's being developed? I know they're accepting community content such as the Kokan remake, but what about the larger things? Entire factions and time periods? Is it possible that mods like Fallen Heroes, Post Scriptum, or Escalation:1985 will be merged? Kind of like Vietnam assets from Project Reality.